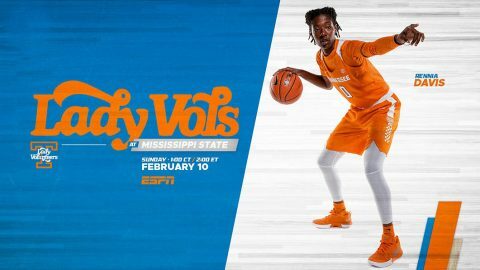 Knoxville, TN – Tennessee Lady Vols (15-7, 4-5 SEC) play its second game in a row on the road, as it travels to Starkville, Mississippi, to take on No. 6/6 Mississippi State (21-1, 9-0 SEC) on Sunday. ESPN will carry the 42nd meeting between the Lady Vols and Bulldogs, as they convene at Humphrey Coliseum for a 1:00pm CT (2:00pm ET) matinee. UT makes its way to the Magnolia State with the momentum of a three-game winning streak, forged with victories over LSU, Florida and Vanderbilt. The Lady Vols won their 10th straight in the series vs. the Commodores last Sunday, defeating Stephanie White’s club, 82-65, at Memorial Gymnasium. MSU, meanwhile, is riding an 11-game streak of triumphs after suffering its only loss of the year on December 18th at Oregon, 82-74. Last Sunday, State prevailed by 16 at Alabama, 65-49. It was the team’s fourth-lowest margin of victory in SEC play behind 15 at home vs. Kentucky and South Carolina, and nine at home vs. Georgia. The Bulldogs have won 25 consecutive SEC regular-season contests entering Sunday’s match-up. Interestingly enough, an unranked Tennessee unit handed a No. 3/2 Vic Schaefer squad its last league loss on February 26th, 2017, an 82-64 decision in Starkville. In four of the Lady Vols’ five SEC losses, they fell by a combined total of nine points, including a one-point loss to Arkansas, two-point setbacks to Missouri and Kentucky, and by four points at Georgia. Mississippi State is 11-0 at home this season, outscoring opponents by an average of 94.5 to 55.1 per game for a +39.4 margin. In four SEC home contests, MSU is winning by a score of 83.4 to 66.3 (+17.1). Tennessee is 4-2 on the road this season, including 2-2 in SEC play. UT won at Auburn and Vandy, while falling at Georgia and Alabama in back-to-back games on January 13th and 17th. MSU has the edge in experience, with four seniors and a sophomore in the starting lineup compared to UT’s senior, three sophomores and a freshman. Roy Philpott (play-by-play) and Brooke Weisbrod (analyst) are on the call for ESPN. Mickey Dearstone is behind the microphone for IMG College/Lady Vol Network radio/online broadcasts for the 20th season. A link to the live audio stream can be found on each game’s Hoops Central page or the Lady Vol schedule on UTSports.com. The game also can be found on Sirius 94, XM 190 and on SiriusXM app 961. This marks the 42nd meeting between the Lady Vols and MSU, with UT possessing a 37-4 record in the series. Tennessee won the first 36 games in the series, dropped three straight to the Bulldogs and then won one in Starkville and lost one in Knoxville. UT is 17-1 vs. Mississippi State in Starkville, 16-2 in Knoxville and 4-1 at neutral sites. Including this game, MSU has been the higher ranked team in the past six games, entering this one with a 4-1 edge over UT. The Bulldogs were ranked in the top four nationally in the three previous meetings to this one. Holly Warlick is 4-4 vs. the Bulldogs and Vic Schaefer, including 2-2 at home, 2-1 on the road and 0-1 at neutral sites (2016 SEC semifinals). The Lady Vols were unable to defend their home court last season, falling, 71-52, on January 21st. UT won on MSU’s 2017 senior day, 82-64, with Jaime Nared registering a career-high 30 points to lead the Big Orange siege. Tennessee suffered its first-ever loss to the Bulldogs on January 28th, 2016, when #13/13 MSU came from 12-down in the fourth quarter to force OT and defeat the #19/23 Lady Vols in Starkville, 65-63. #15/15 MSU took the second meeting in the SEC semifinals that year, taking a 58-48 triumph over the unranked Lady Vols in Jacksonville on March 5th, 2016. In the 2012 matchup in Starkville, won by Tennessee, 57-41, UT scored its (then) fewest points in the series, while State posted its second-lowest total. UT’s 48 points in the 2016 SEC tourney became UT’s lowest scoring total in the series. Third-year UT assistant coach Sharrona Reaves was an assistant coach and recruiting coordinator at MSU from 2008-10. Losing four of the games by a combined nine points, UT dropped five consecutive league tilts before bouncing back with wins over LSU, Florida and Vanderbilt. UT also fell to Notre Dame during the midst of that SEC skid, 77-62, in a game the Lady Vols led at the half by three en route to their sixth straight loss. That game, however, seems to have been a turning point for this team. UT features four players scoring in double figures, including two sophomores and a freshman. Sophomores Evina Westbrook (16.0) and Rennia Davis (14.0) lead the way in scoring average, followed by senior Meme Jackson (12.0) and freshman Zaay Green (10.2). After seeing Davis mired in a four-game slump, she has reemerged as a go-to player, firing in 24, 19 and 17 points in the past three games, all victories. Jackson had suffered a performance lull as well after hitting double figures in 10 of her first 13 games, including a 27-point effort at Auburn. The senior missed two games (N.D., LSU) after injuring an ankle vs. Arkansas, and she carded her first double-figure scoring game since Jan. 3 when she fired in 17 vs. Vanderbilt to get back on track. Center Kasiyahna Kushkituah scored in double figures in four of her first five games this season before a knee injury forced her to miss three games and limited her mobility in the next 11 outings. Kushkituah shed a bulky knee brace during the LSU game and finished the day with 14 points and eight rebounds. She followed with six points and six rebounds on 3-of-4 shooting vs. Florida and tallied an 8 and 6 day vs. Vanderbilt to demonstrate consistency in the post. Senior forward Cheridene Green has pulled down double-figure totals in rebounds in seven of her past nine contests. Freshman Zaay Green has averaged 11.6 ppg. over the past five contests and yanked down a career-high-tying 11 boards vs. Vandy. Freshman Mimi Collins hit double figures in points for the fourth time this season and the second time in SEC play when she contributed 10 vs. Vanderbilt. Eight of those came in the fourth quarter. The Lady Vols went 17-of-20 from the free throw line in the fourth quarter to secure their third straight victory, defeating rival Vanderbilt on Sunday, 82-65, in Memorial Gymnasium. Sophomore Evina Westbrook led UT (15-7, 4-5 SEC) in scoring with 18 points, followed closely by sophomore Rennia Davis and senior Meme Jackson, who had 17 apiece. Davis posted 12 rebounds to record her second straight and sixth overall double-double of the season. Freshman Meme Collins also found her way into double digits for Tennessee with 10 points, eight of which came in the fourth quarter. Vanderbilt (6-16, 1-8 SEC) was led by redshirt junior Mariella Fasoula who had 16 points, eight rebounds and went a perfect 6-of-6 from the free throw line. Chelsie Hall and Autumn Newby each had 11 for the Commodores. MSU is led by 6-7 center Teaira McCowan, who is averaging 16.9 ppg. and 13.7 rpg., while shooting 66 percent from the field. Also scoring in double figures are Texas A&M graduate transfer Anriel Howard (15.5 ppg.) and Arkansas transfer Jordan Danberry (13.0). MSU lost three-point ace Chloe Bibby (11.9 ppg., 36 3FGs) to a knee injury in the season’s 18th game. The Bulldogs are outscoring foes 88.2-54.4 in all games and 81.8-57.7 in league play. MSU has finished as runner-up at the Final Four the past two seasons and won its first-ever SEC regular season crown in 2017-18. MSU lost four starters from that squad, including WNBA Draft pick Victoria Vivians (19.8 ppg.). No. 6 Mississippi State turned in dominating second half on the defensive end of the floor to pull away to a 65-49 win against Alabama on Sunday. Anriel Howard led the Bulldogs (21-1, 9-0 SEC) with 24 points. Teaira McCowan recorded her 18th double-double of the season with 12 points, 12 rebounds and four blocks. Jazzmun Holmes added 10 points. Howard also had seven rebounds. In the third quarter, the Bulldogs held the Crimson Tide to just seven points. The Bulldogs forced 12 second-half turnovers. Mercedes Russell recorded 16 points on 7-for-9 shooting, but No. 6/7 Tennessee was unable to overcome a 13-point halftime deficit in a 71-52 home loss to No. 3/3 Mississippi State on January 21st, 2018. Jaime Nared added 12 points for the Lady Vols (16-3, 4-2 SEC). Victoria Vivians led MSU (20-0, 6-0 SEC) with 24 points and nine rebounds, while Teaira McCowan added 12 points and 18 boards. After Anastasia Hayes made it a seven-point game with a free throw early in the fourth quarter, MSU was able to shut down UT offensively, allowing no field goals over the final eight minutes while closing the game on a 14-2 run. Tennessee earned one of the biggest wins of the Holly Warlick era on Feb. 26, 2017, defeating #3/2 Mississippi State, 82-64, at Humphrey Coliseum. Jaime Nared paved the way for UT’s offense, dropping a career-high 30 points and nine rebounds. Diamond DeShields had an all-around effort with 20 points, six assists and five rebounds. The win marked the first victory over a Top-3 opponent on the road for Tennessee (19-10, 10-6 SEC) since the Lady Vols defeated No. 1 Duke, 72-69, on January 24th, 2004. Jordan Reynolds also had a productive game, tying her career high in points with 17 to go along with eight rebounds and three assists. Victoria Vivians led the Bulldogs with 18 points. The Tennessee Lady Vols return home to face Auburn in a Valentine’s Day game at 8:00pm CT on February 14th (SECN+).